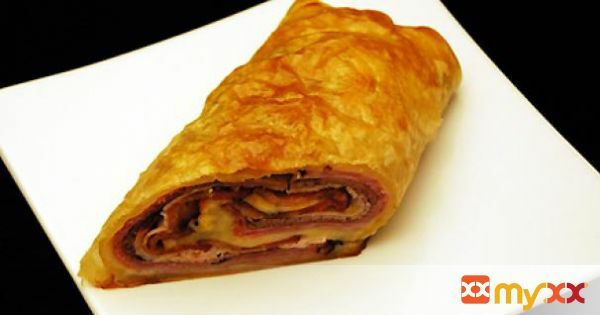 Stromboli....All Of Your Favorite Meats Rolled Together To Make A Winner Winner Stromboli Dinner. 1. Lay down a sheet of wax paper or parchment paper onto the counter, unfold the pastry and lay it on top of the paper. 2. Top with another section of wax paper; use a rolling pin to just thin the dough slightly and to take the creases out then remove the top sheet of paper and lightly prick the pastry with a fork so it does not rise too much when baking. 3. Lay down the ham then top with the roast beef then the turkey and bacon, cover the entire thing with the cheese. 4. Use the paper to help roll the pastry into a log, lay the seam side down on a parchment lined baking sheet, mix the egg and water in a small dish then brush the top of the Stromboli. 5. Bake in oven for 25 to 30 minutes or until golden brown, this makes enough for 2. 6. Slice in half and drizzle with your favorite Alfredo sauce, marinara sauce or eat it as is.